The other day, I glanced at the clock and was shocked to see how the time had passed me by. Exasperated, I was racing against a deadline and hadn’t even thought about cooking dinner, finishing the dishes and laundry yet! I was flustered and frustrated! We all need to find ways to make our lives easier, don’t we? Here is how I’ve simplified my life by organizing my kitchen into zones. In a world of constant busyness, creating a solution that can help simplify things can be a true sanity saver. Can I get an amen?! 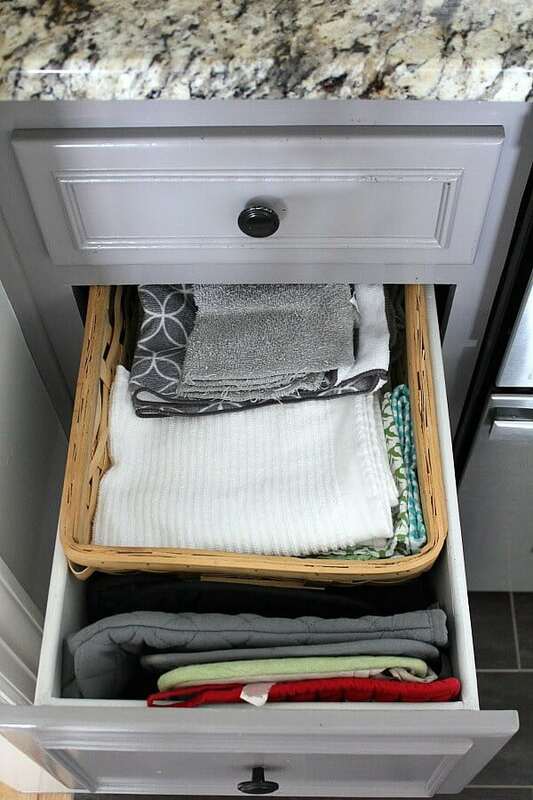 So these simple tricks can save you time, effort and stress by just moving a few things around. at no cost to you. You can read my full disclosure here. So what do I mean by zones? The idea is to streamline your space to create a cohesive work area that doesn’t leave you exasperated like I was. 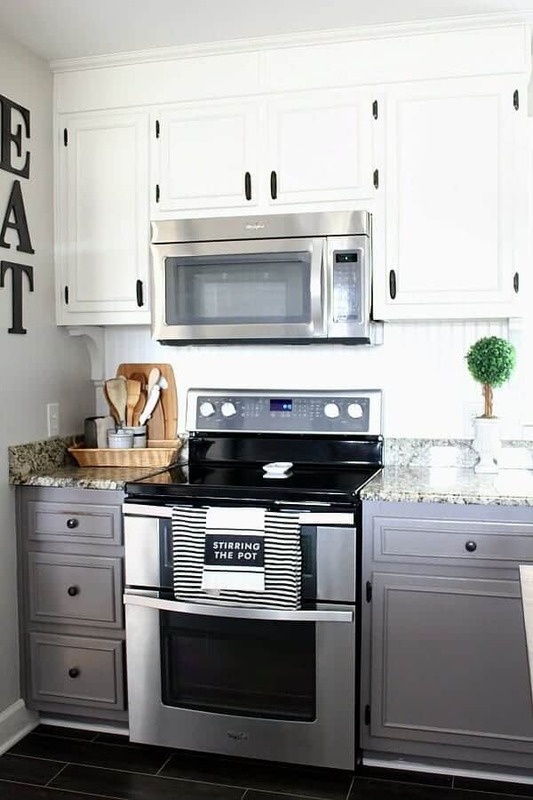 With everything in arms reach of the task you are doing — be it cooking a meal, unloading the dishwasher, or making a cup of coffee — you can save precious minutes and be frustration free with a simple switch-a-roo! 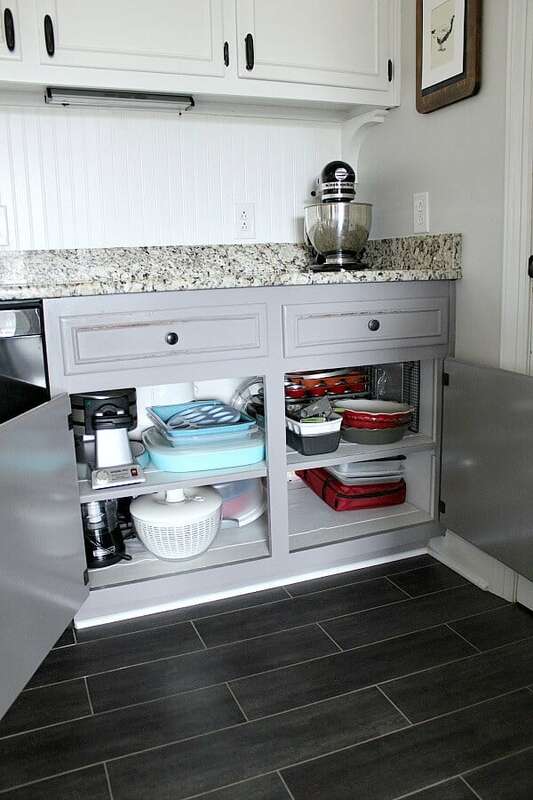 For me, I’m organizing my kitchen into zones that make sense for my floorplan: Cooking, Beverage, Baking, Dishwasher, Pots and Pans, and Pantry Zones. 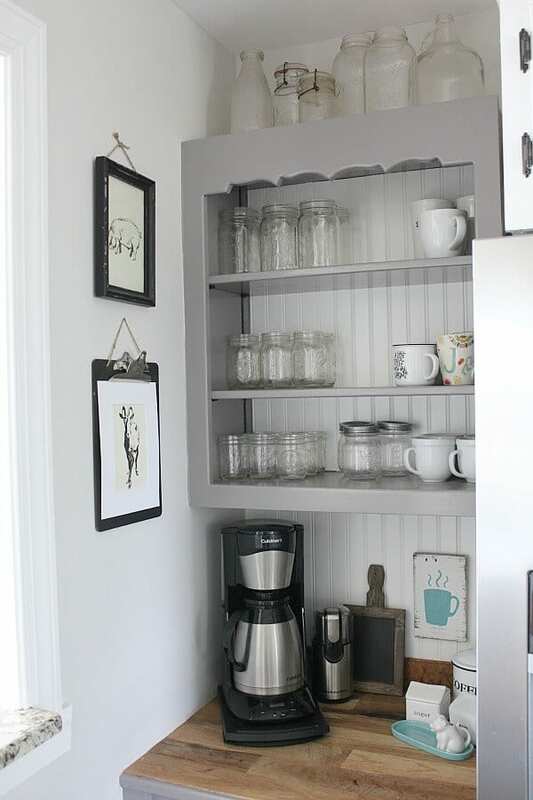 If you missed my Farmhouse Pantry Reveal last week, you can check it out to see how I’ve organized that space. 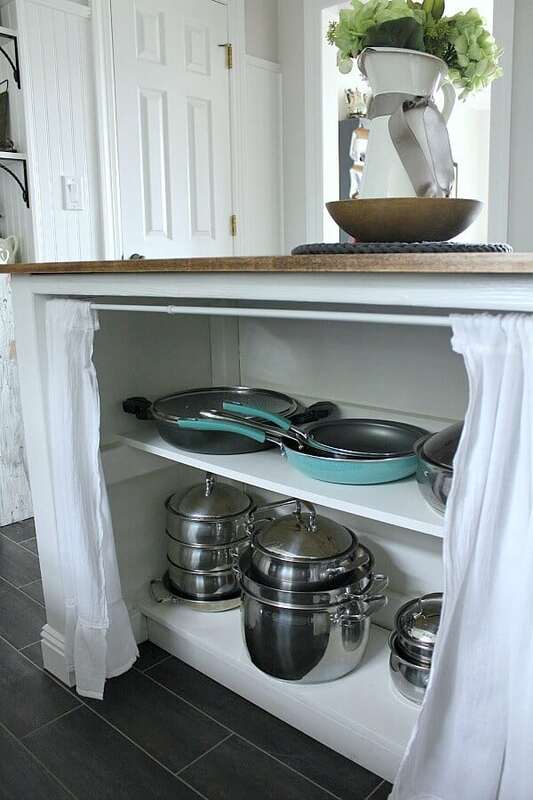 The drawers and cabinet beside my stove hold any cooking tools you might need. 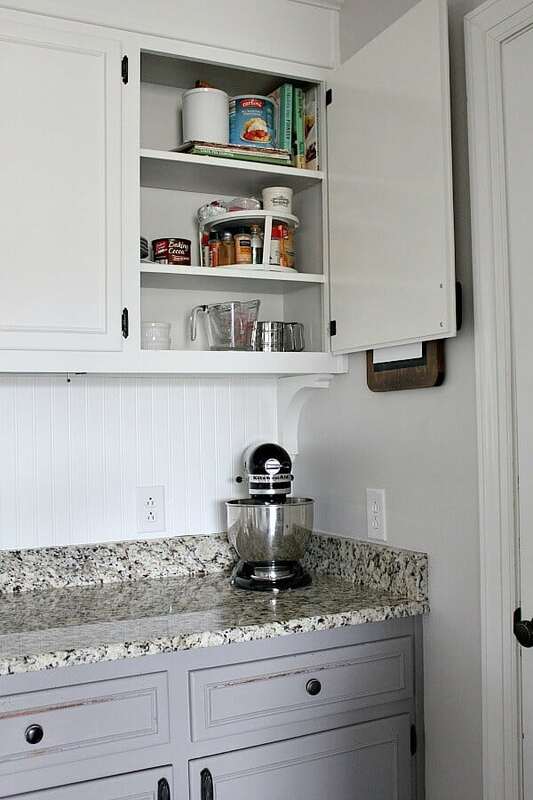 In the top drawer, you’ll find measuring cups and spoons, as well as smaller cooking utensils. Below that are my potholders and kitchen towels. 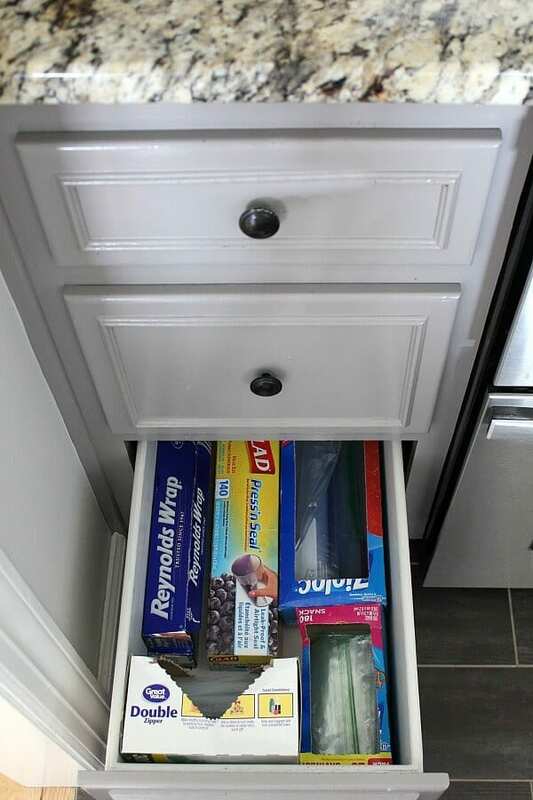 And the bottom drawer has tin foil and plastic wrap and bags. The drawer to the right of the stove has my larger cooking utensils. We added shelves to the cabinet below to hold our pizza pans, baking sheets and cast iron cookery. 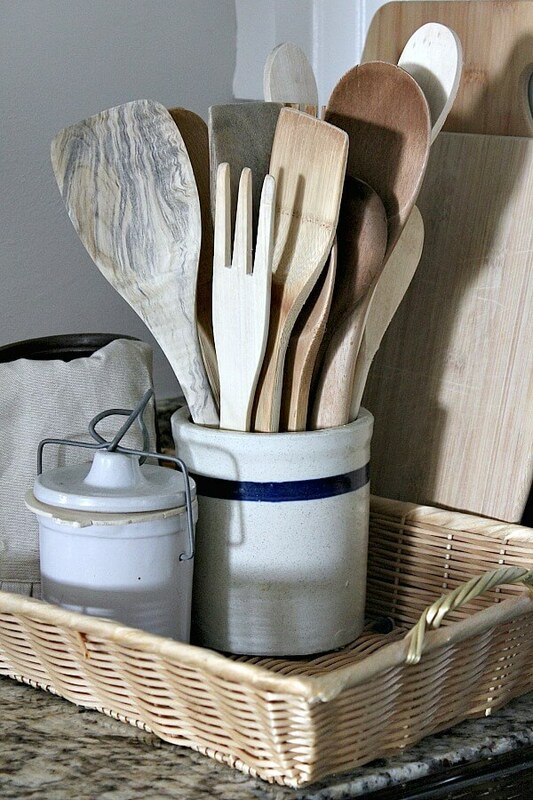 One the counter, I keep my cutting boards and wooden spoons displayed because they’re just so pretty! I love displaying them old crocks that came from my family. The beverage station is pretty self explanatory, but I’ll show the details of how I moved a few things around. I thinned out our glasses and mugs to showcase only what we actually use. The rest was donated or put away if it was seasonal. This was originally planned for a desk area, but the seating is extremely cramped, so I turned it into my coffee bar area. 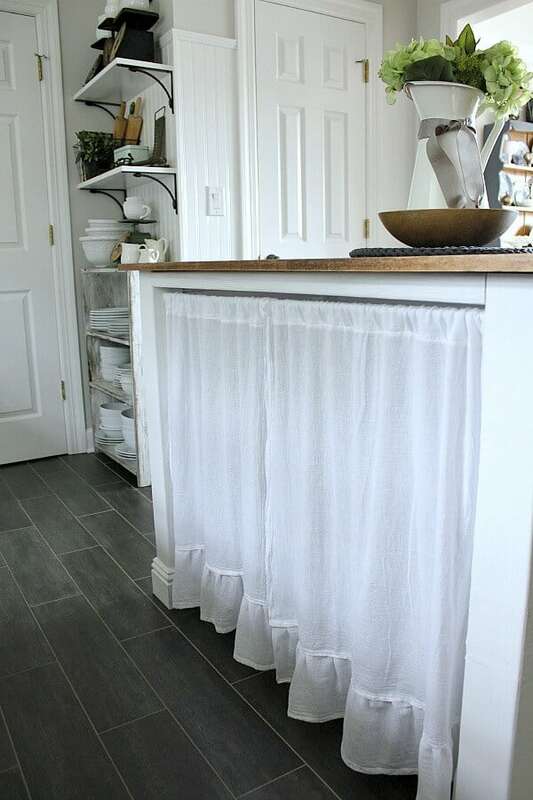 I skirted the desk area with a DIY curtain made from some linen tea towels. Above my refrigerator is where we keep our pitchers, and larger and more commonly used to go cup and water bottles. This was the biggest switch-a-roo that I made. 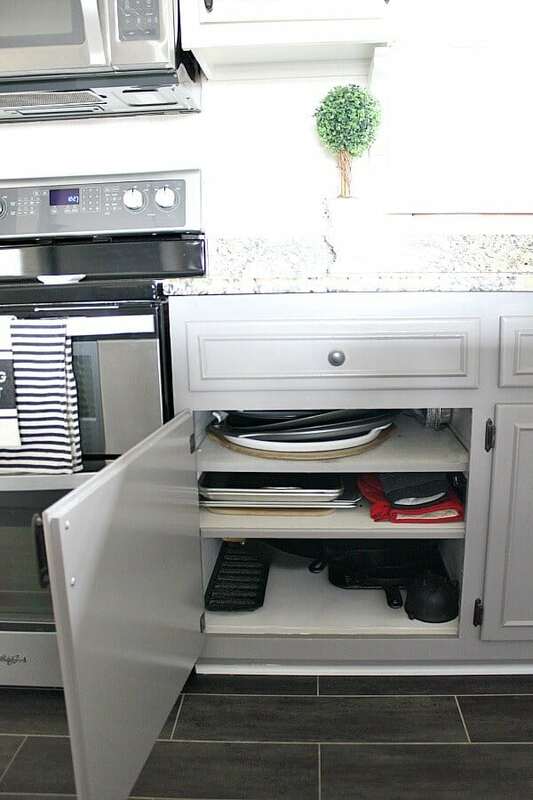 I wanted to be able to stand in one place and quickly unload the dishwasher with out having to make multiple trips back and forth. Other, than my glasses, most everything lands right around here. By far, those glass food storage bowls were the best investment I’ve ever made. I’ve had them for years and they are so resourceful. Much better than tupperware type containers, the glass makes reheating and cleaning so easy! In the drawer next to the dishwasher is where our silverware sits. And on the wall opposite the dishwasher is where I place my plates. It’s a simple pick up and twist to put all my dishes away! When baking happens in this kitchen, I love that I have a designated area where my mixer and all my tools are as well as ample counter space to work. 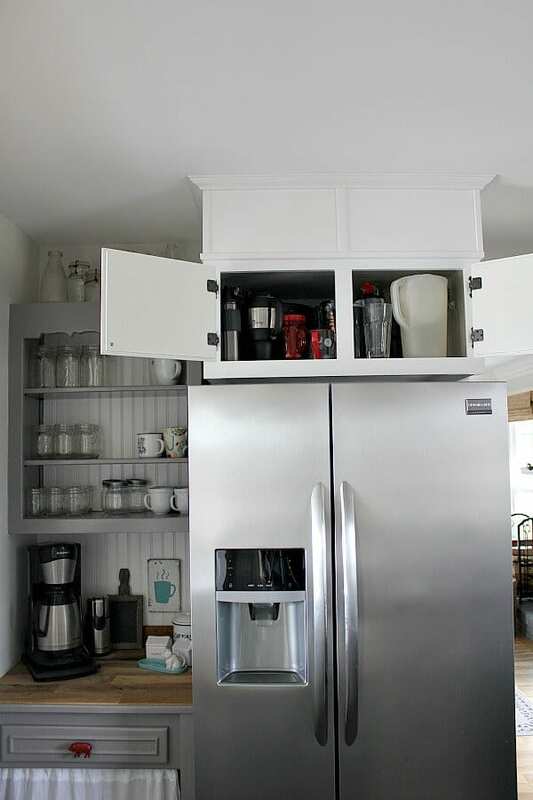 Above my mixer is where I store my cookbooks, baking ingredients, and tools. 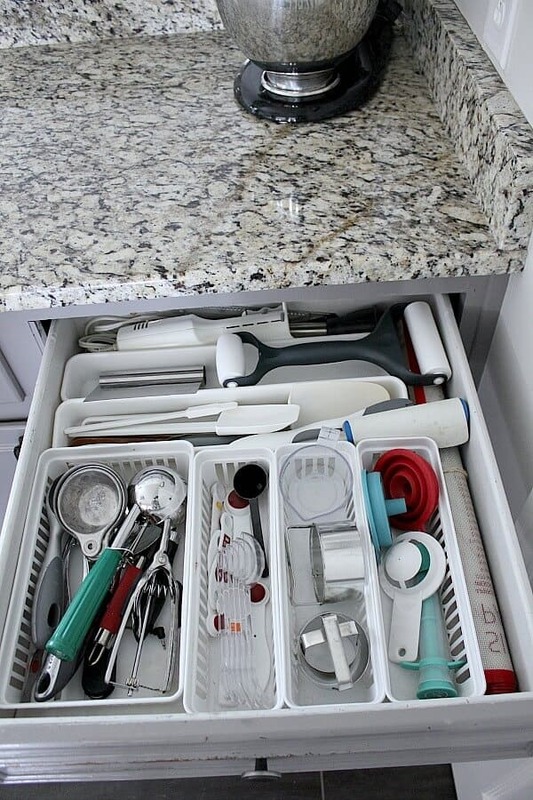 In the drawer below sits more measuring spoons and baking utensils. And in the cabinet below are my pie and loaf pans, as well as my cake and treat carriers. 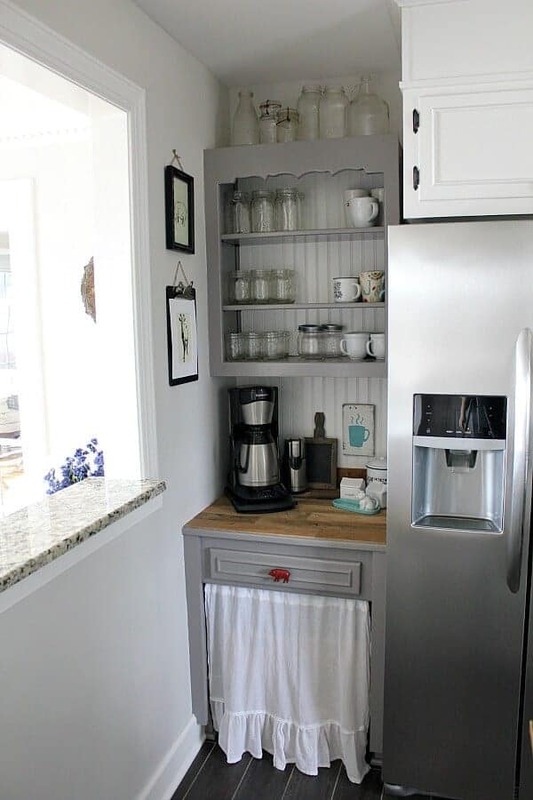 This is where I also place my baking related cooking appliances, like my food processor and blender. 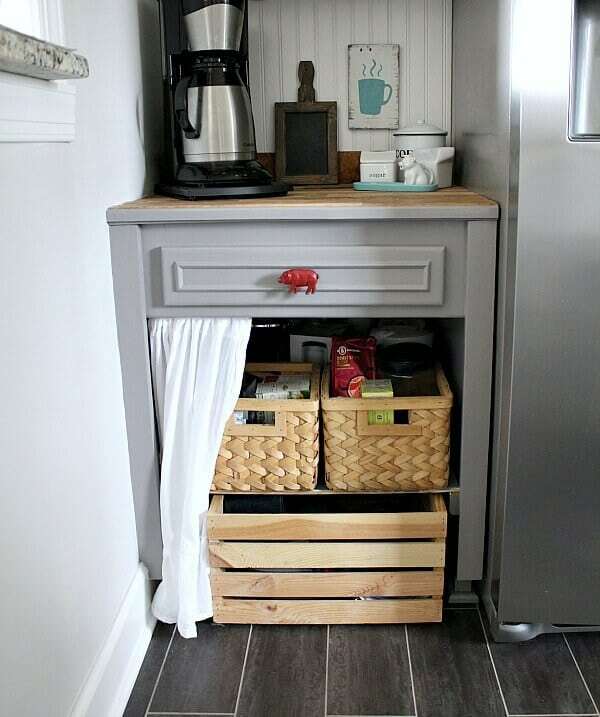 I love my DIY Farmhouse Kitchen Island, but I didn’t love that you could see the storage area beneath. 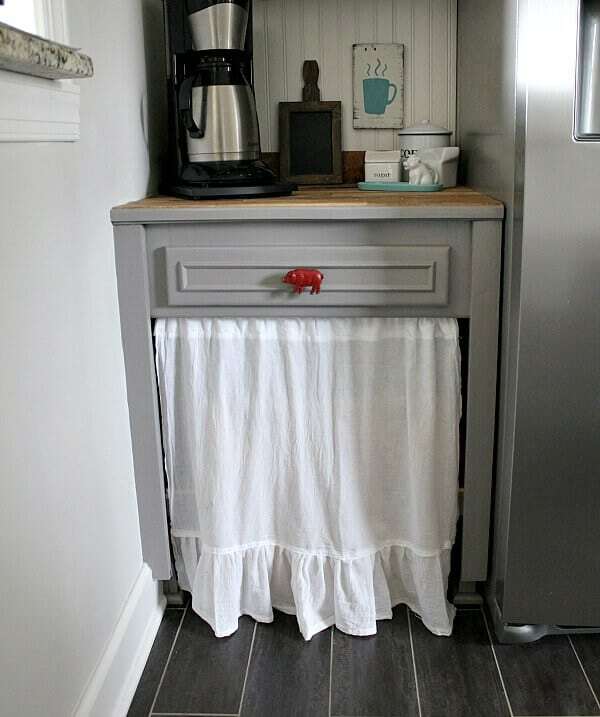 So by using the same linen for my coffee bar skirt, I made a matching one for my kitchen island and hung it using a simple tension rod. Behind the curtain is where I have placed all our pots and pans, which it right next to my cooking zone. So we’ve made it full circle! The only areas I’ve left out are our Farmhouse Pantry and under our kitchen sink. 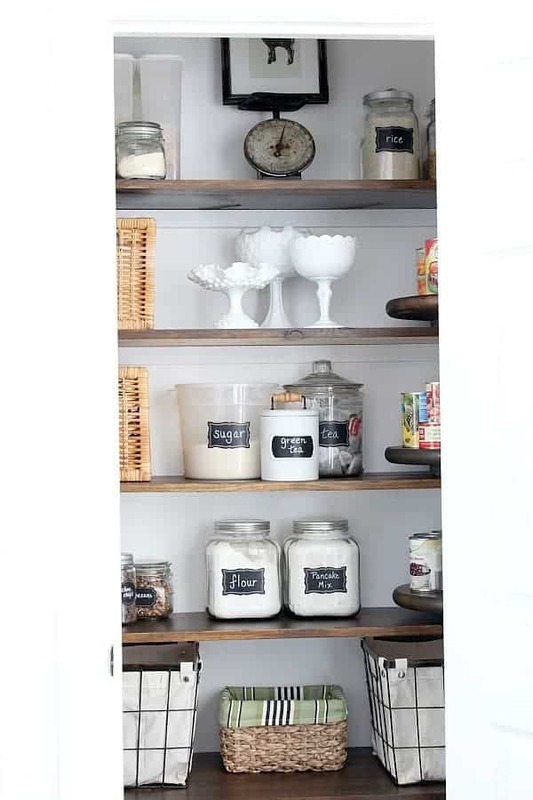 You can read the details of our Pantry in this post. 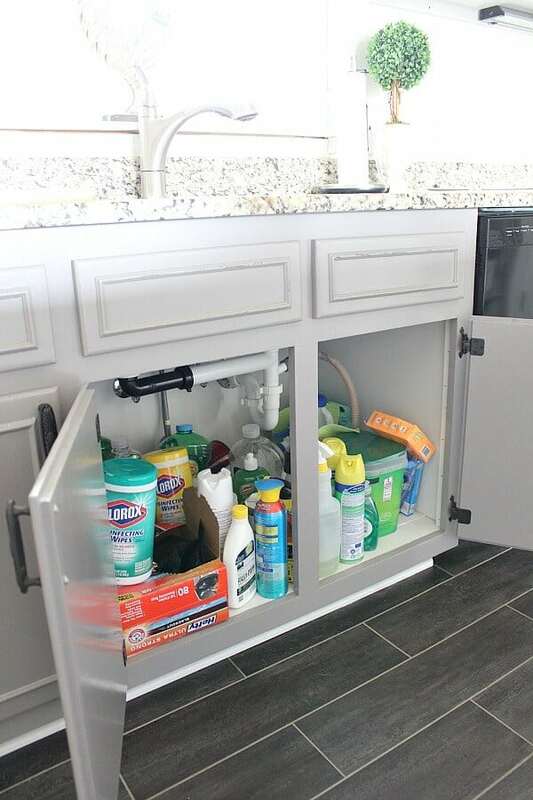 Beneath my sink is where our cleaning supplies live. How sad is it that the cleaning supplies are so not clean and tidy?! This spot is what I hope to organize soon, so stay tuned for how I plan to get this area under control! So hopefully this is the beacon in the midst of foggy disorganization! If I’ve left any details out, or if you have any additional tips to share, please leave a comment below – I love to hear from my readers! Great post, Jen! Very clear and logical! Have a great weekend! Thanks Julie! I hope your weekend is blessed! 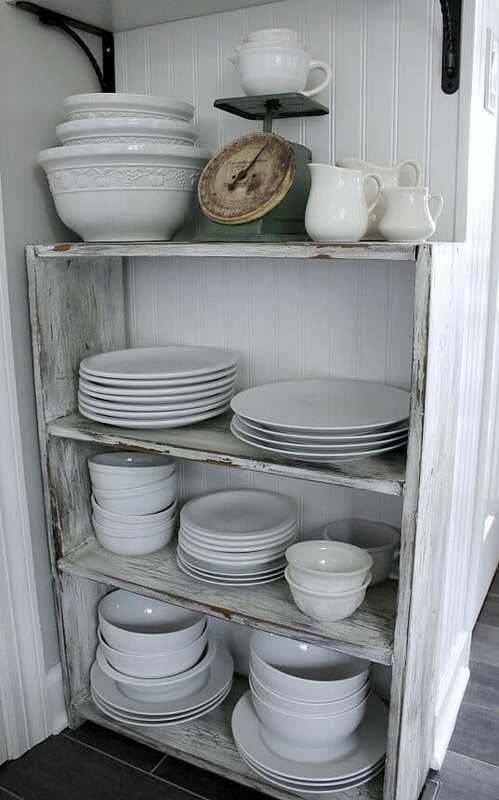 Our kitchen could so do with some reorganizing. It always looks like a bomb went off inside it and that’s after I’ve done the dishes. 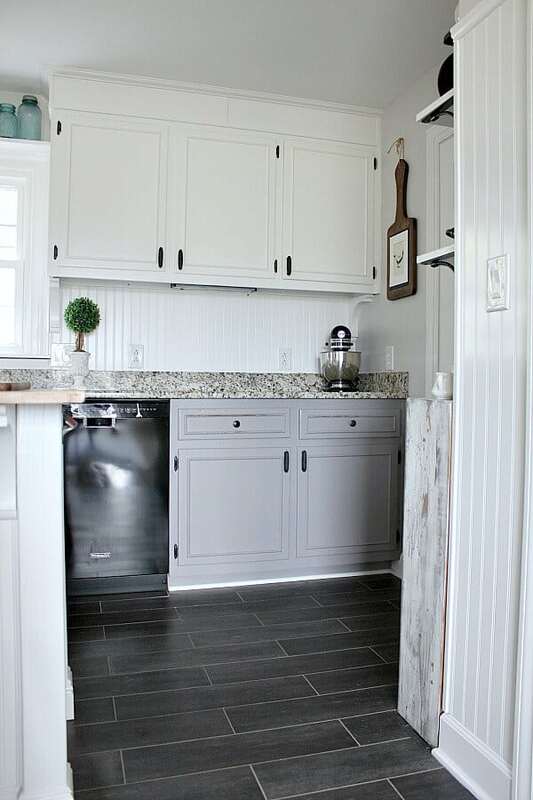 Thanks for the post Jennifer, organizing the kitchen into different zones makes a whole bunch of sense. 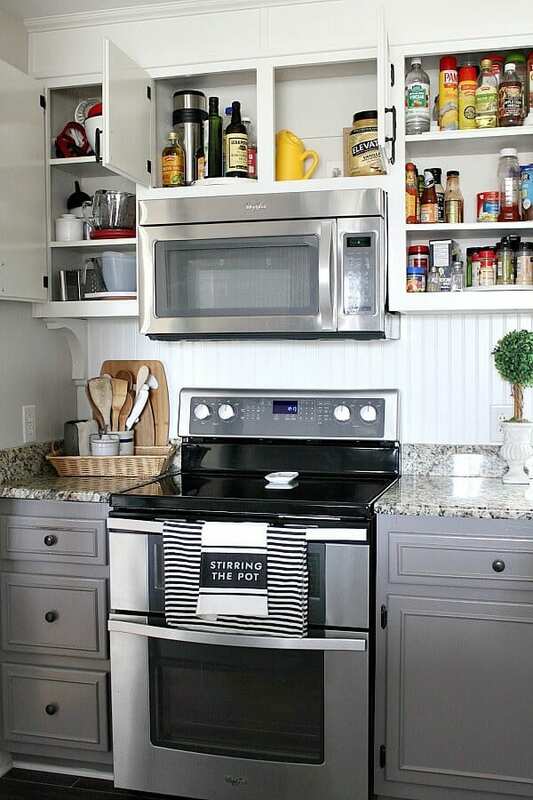 A very well organized kitchen makes cooking so much easier. I think our kitchens are set up similar! I’m about to move my spices away from the cabinet next to the stove because the steam is affecting them. Thanks for sharing with us at Merry Monday. So neat and organized. All of my kitchen looks way worse than your cleaning supplies closet, but I totally lack the energy to do something about it. Maybe your post will provide enough inspiration to finally get down to it…Thank you for sharing at The Really Crafty Link Party this week. Pinned! Thank you so much Sophie! Our kitchen has been a long and slow remodel in order for us to save money. I truly appreciate your sweet comments! 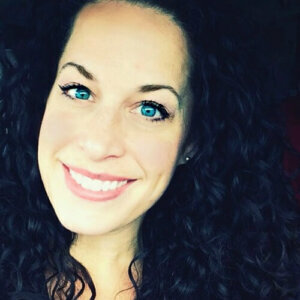 Michelle – you are so kind! I’m glad this post inspired you. Thanks for taking a moment to leave me such sweet words! 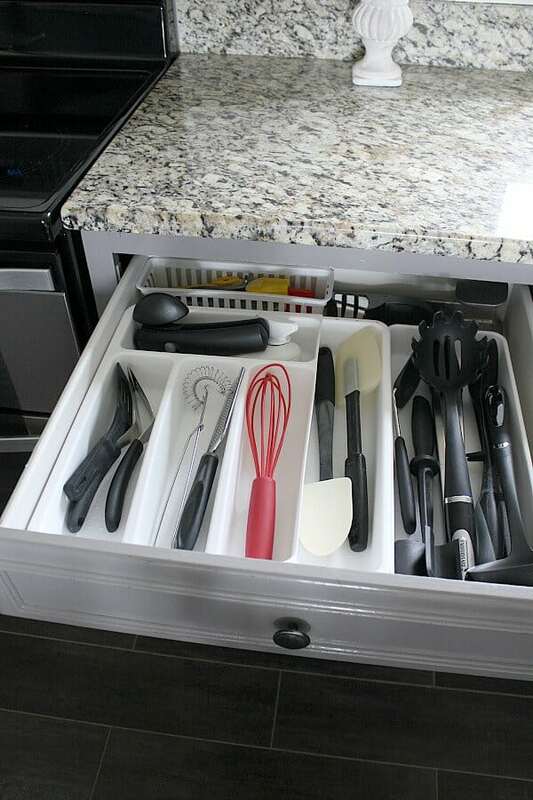 Good luck with your kitchen organization! Great ideas! 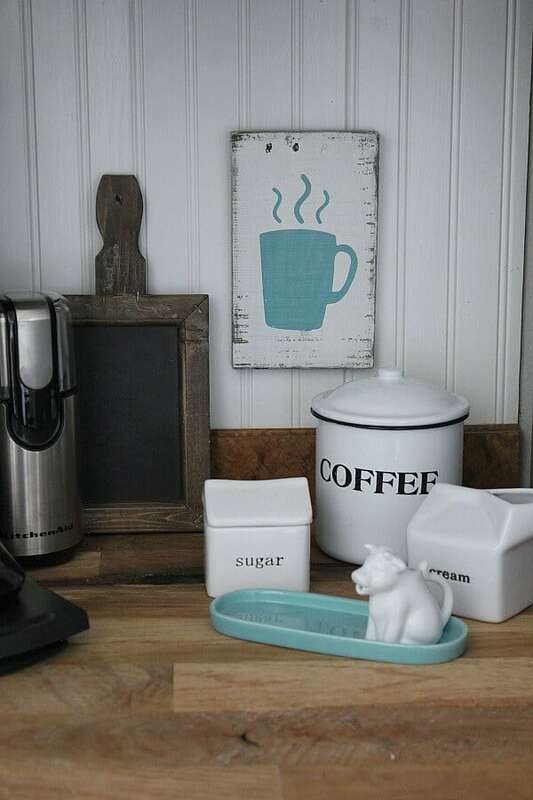 Thanks for sharing in the To Grandma’s House We Go DIY, Crafts, Recipes and more link party! Thanks Sheri! I always enjoy linking up! Thanks so much Shirley! It’s fun to link up and be inspired! Thanks Teresa! I always love to share and find new inspiration through your linky party. Glad to know this inspired you! Congratulations on being featured over at Marty’s “Inspire Me Tuesday”! You have so many great tips in this post. Beautiful kitchen! This is a great post! 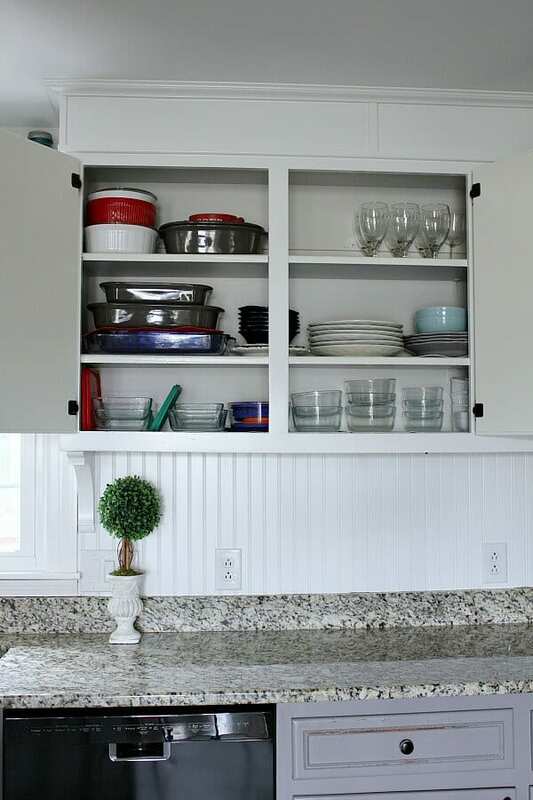 I love the way you’ve organized your kitchen into different zones–it’s all so thoughtfully arranged and looks very easy to use. 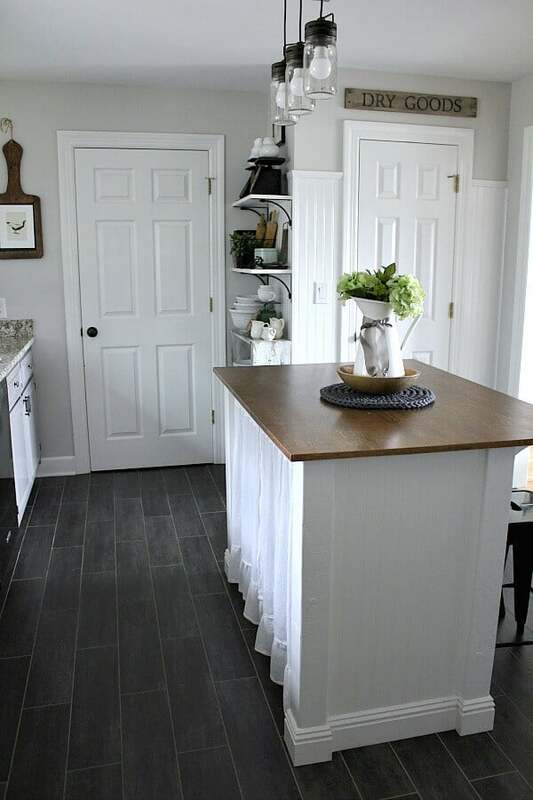 Thank you for opening up those doors and drawers–it’s good to see what a real kitchen looks like! Richella – You are so kind to feature me! I’m grinning from ear to ear. I always enjoy linking up and finding inspiration at your parties! Organizing anything is an art! 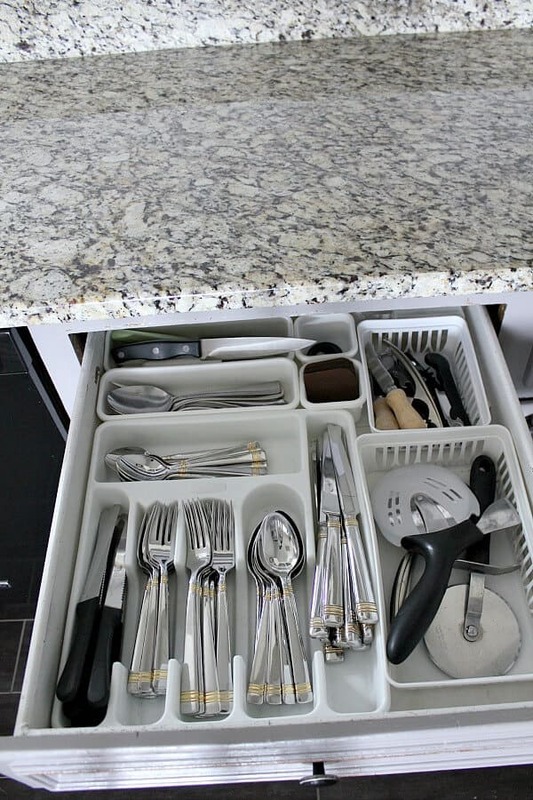 Everyone likes organized stuff, it is pleasing to the eyes and also makes things easier. 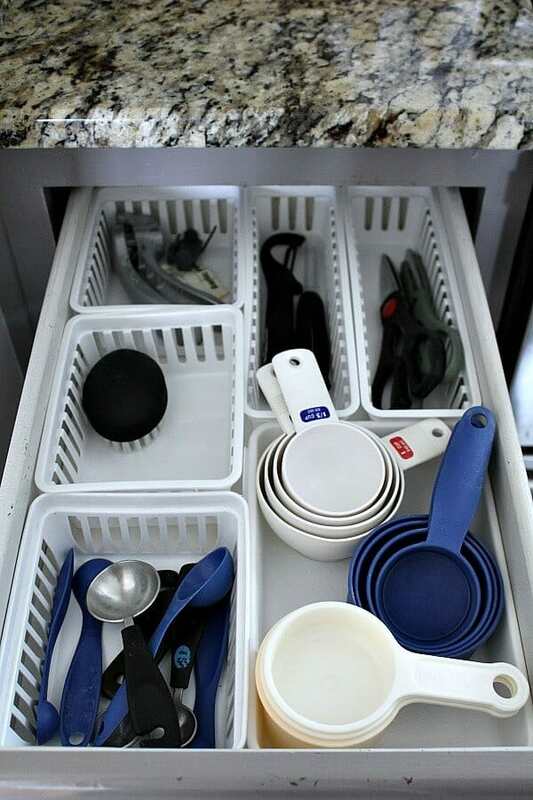 We can organize the kitchen in our budget limits. We don’t need to invest a lot to be organized. I love the finish you gave it!! !